The sizes of TV sets are varied, and finding the best TV wall mount can be quite the task. However, some relevant information about TV sizes might help. In 2013, a closer look at the TV screens being bought and searched around the web shows that the most popular size is a 40 inch flat screen TV, which had around 59.39% of the traffic. The second most popular was the TV screen that measures 55 inches with 15.32% of the searches and then is followed by the 32 inch TV with 13.33%. That means a majority of TV sets, in fact a little more than 87%, are within the range of 32 inches to 55 inches. With those numbers in mind, it is not a bit surprising to find out that the TV wall mounts servicing 20 to 50 inches TV screens are more popular than others. One of the more popular TV wall mounts is the Mounting Dream MD2380 TV Wall Mount, and for good reasons. This TV wall mount has a large weight capacity, is light and can even tilt and swivel. 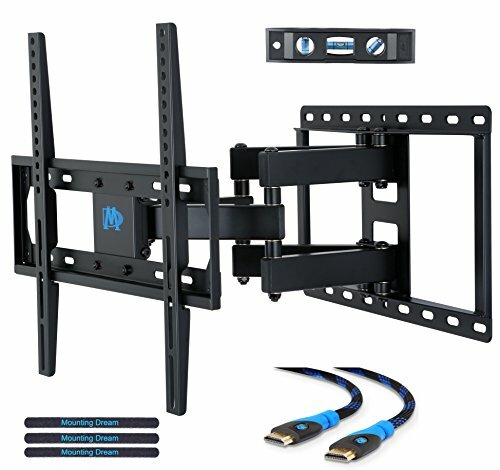 This wall mount, due to its capacity for a TV set’s size and weight, is categorized for the middle market, which ranges from 32 inches to 47 inches. But before we dive in to the product, let us talk about the company who made this first. Mounting Dream is actually a brand, not a company, that handles this kind of wall mounts. The main company that manufactures Mounting Dream MD2380 TV Wall Mount is actually Shenzhen Xinadda Ir-Pi Products, a Chinese company. They are known more with the name Xinadda, and they focus on the development, the production and the marketing of display mounts and accessories. A good thing to note is their product lineup. They have 77 products as TV wall mounts alone. They also offer mounts for any ceiling display and even mounts for projectors. They have also partnered with big retailers like Walmart, Lowes, Costco, Target, and Home Depot. The product itself is really good. This is one of the Mounting Dream line’s bestsellers. Xinadda has offered this MD2380 TV Wall Mount in just this size (for 26 to 55 inches Flat screen TV sets) but comes in two other kinds, which is about the stud attaching. There are two types available, one for the 16 inches wooden stud and another for the 16 or 24 inches wooden stud. Now for the specifications of MD2380 TV Wall Mount. This is a swiveling and tilting wall mount, but the base itself is of the low profile variety. This means that while it can be adjusted up, down left and right, the base itself is stationary. Once you have chosen a location to install the TV wall mount, make sure that you will not change your mind. This TV wall mount can hold TV sizes from 26 inches to 55 inches wide. The MD2380 TV Wall Mount can hold up to 99 pounds of weight. The VESA standard is used for the screw holes. There should be no problem then with most if not all of the TV set brands in the market now. The screw hole sizes run all of the VESA hole measurements, allowing for more options for carrying TV sets. It can carry VESA screws and holes measuring 3 by 3 inches, which is 75 x 75 mm, to the maximum 16 x 16 inches or 400 x 400 mm. This range runs all of the VESA measurement standard sizes. This wall mount uses two wooden studs. The tilt and swivel capabilities are great. It has +5°/-15° Tilt, +/-45°Swivel and +/-3° rotation. That gives it a lot of possible viewing perspectives in one location alone. This wall mount measures 17.1 x 16.5 x 15.9 inches. It can extend 15.2 inches from the wall and retract 3 inches to the wall. This TV wall mount is incredibly strong. It can carry a Flat screen TV measuring 55 inches. You can also be confident of its strength. The capacity that is recommended is 99 pounds, but it is very rare to find a 55-inch TV set that weighs more than 95 pounds. The tilting and swiveling functions are very good! The adjusting does not make any noise and is actually very smooth. It can accommodate all VESA standard screw distances. Some wall mounts do not cover the 75 x 75 mm standard, so that is a plus. It uses two wooden studs and there are more houses and buildings that have two studs than a single one. The retracting and extending capability is limited. Granted 15 inches from the wall is average, but there are some wall mounts that can carry heavier TV sets and can extend them to 16 or even 20 inches. The instruction manual is too long (around 11 pages). It is not difficult, but it could be simpler and shorter. The Mounting Dream MD2380 TV Wall Mount is a good TV wall mount for most TV sets used in the market today. However, the installation and mounting might not be as simple as other wall mounts. The sturdiness and the flexibility is great, and is actually higher than most of the same products in the market. This TV wall mount is highly recommended!